Beginning graduate students in mathematics and other quantitative subjects are expected to have a daunting breadth of mathematical knowledge. But few have such a background. This book will help students to see the broad outline of mathematics and to fill in the gaps in their knowledge. The author explains the basic points and a few key results of all the most important undergraduate topics in mathematics, emphasizing the intuitions behind the subject. The topics include linear algebra, vector calculus, differential geometry, real analysis, point-set topology, probability, complex analysis, abstract algebra, and more. An annotated bibliography then offers a guide to further reading and to more rigorous foundations. 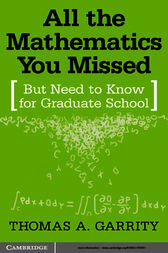 This book will be an essential resource for advanced undergraduate and beginning graduate students in mathematics, the physical sciences, engineering, computer science, statistics, and economics who need to quickly learn some serious mathematics.